Earlier this summer, The Rhema Foundation Canada sent a team of enthusiastic volunteers to Kampala, Uganda on a medical humanitarian mission aimed at delivering medical support and supplies to the city’s most vulnerable neighborhoods. While the early days of the trip – which you can read about here – were dominated by visits to local clinics such as the Kisenyi Health Centre, the team was also eager to learn more about how the country’s fragile healthcare system was impacting life outside of the clinic. As a result, the team arranged to visit a handful of local schools, in order to examine the links between healthcare and education in Kampala. The first school the team visited was the Summit View School – which is largely considered one of the worst schools in Kampala due to the severe lack of resources available for the students who attend. Upon entering, the team immediately noticed the many broken windows and dilapidated walls that form the humble classroom. Worse still, was the clear presence of asbestos inside the walls and ceilings. Overall, the building is a stifling structure, which offers little light and almost no ventilation for the students and teachers inside. The poor infrastructure is exacerbated by the lack of food and running water available. This means that after walking as far as 20km to attend the school, many children are forced to spend the entire day without anything to eat or drink. When combined with the heat and lack of fresh air, the team found it difficult to comprehend how students were able to learn in such a difficult environment. As if the conditions at Summit View were not enough of a hindrance to learning, the process is made even more difficult for girls due to the stigma surrounding menstruation. This stigma, combined with a lack of adequate menstrual supplies and lack of safe bathroom spaces, means that many girls miss as much as 15 days of school per month due to their periods – a fact that makes it nearly impossible for them to keep up in school with their peers. This issue was particularly poignant for The Rhema Foundation Canada team, and has already inspired an effort to bring awareness to the issue and to raise 1 million pads for women in need through partnerships, fundraising events, and community outreach. The team’s commitment to helping young girls and the other students at Summit View was further bolstered by a visit to a neighboring school – one with with far more resources at its disposal. These other students were fed at least one meal a day – sometimes two – and are thus able to better concentrate on their studies. 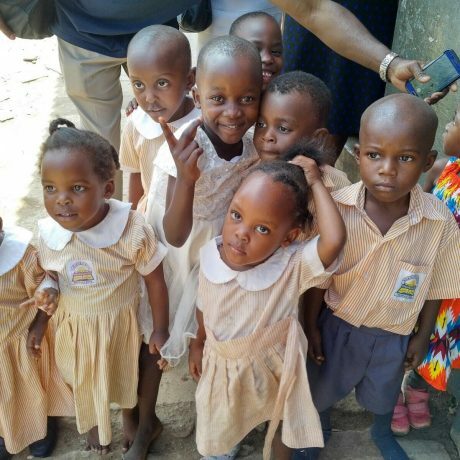 The differences between the schools served to underline the importance of proper nutrition and healthcare for students, thereby emboldening the team’s efforts to improve school infrastructure in Kampala. The visits to the local schools ultimately demonstrated to the team that Kampala’s educational system is in dire need of attention in regards to infrastructure, appropriate provisions of meals, clean drinking water, improved sanitation, and access to computer systems. With the trip nearing its end, the team was beginning to gain a more clear understand of how its efforts could make a difference in Kampala. To read the conclusion in our ongoing Uganda series, check back for the next installment!